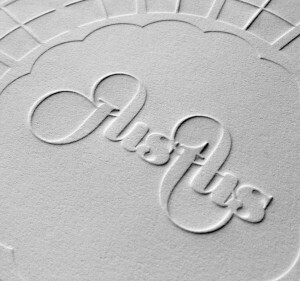 Watermarx Graphics is proud to share the news that we have been awarded the FSEA 2013 Gold Leaf Award in the USA for “Excellence in Foil Stamping & Embossing” with the work we did for the 2nd edition of Justus Magazine, To Letterpress With Love. This was part of the awards sponsored by the Foil and Special Effects Association of America which are a major competition in the international print community and have been going for 20 years. This year, they received nearly 250 entries in 29 categories, demonstrating the best work in foil stamping, embossing, and other specialty effects from around the world. The award winners, they say, are “a culmination of the most creative, brilliant and technically difficult works in the industry.” So, needless to say we are pretty stoked. We entered Justus Magazine into the capabilities brochure category, as the entire volume was designed to showcase just what is possible with CLIQX technology. We were able to really push the limit with letterpress, embossing and debossing to make Edition 2 the award winning design inspiration piece and keepsake it was designed to be. We won a bronze in the same category last year, again using CLIQX . It’s an honour and a very exciting experience to see the USA recognise the quality of our work and reward the results that can be achieved by this technology, against such impressive competition.